How many times have you seen it: the massive city, the grinding machinery of the state, the downtrodden under the wheels of the machine — it’s a classic dystopia. One man (or, rarely, woman) fights back, foments a rebellion, and it all comes crashing down, ushering in a new day. End of movie or novel. It seems to me that this trope has been overused. I have no real argument with all those stories that end with the destruction of a dystopia, but I was looking for something a bit more subtle in Like Clockwork. There is something resembling a downfall (you’ll get no spoilers here) but it doesn’t come at the end, and those who bring it about have to face the reality of what they have done. Here’s a taste. (Hemmings) laid his head on his crossed arms. His heart hurt. Life may be nasty, brutish, and short. Life may be eternal in the lap of Jesus. Or life maybe a recurring year, extended far too long, but it is still life. And Hemmings had taken the lives of men who had done him no wrong. He had not known the others who had died, but he clearly remembered the guard at the waggon door. He grieved for him. I know exactly where this scene originated. I was a young teen. 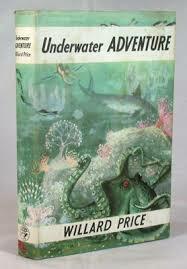 I had recently discovered the local public library and my hundredth-or-so book was Underwater Adventure by Willard Price. Overall, it was a good book, although no better or worse that the average I was reading at the time. However, one scene knocked me out. The villain, posing as a friend, went for a dive with the mentor. The two brothers who were the heroes of the book were elsewhere. The villain contrived to have the mentor trapped underwater, and left him there to drown. Two things about this affected me. First, the mentor did not make a brilliant and heroic escape. He actually did drown. Second, the villain — who was pretty scummy and eventually came to a well deserved bad end — came up out of the water full of remorse. Not enough remorse to go back and save the mentor, but enough to be shaken. The scene was told from the villain’s perspective. In that moment, I identified with him far more than I had identified with the cardboard heroes. Through him, I came to an understanding of how it would feel to take the life of a good man. It was something worth knowing, and something a bit more real than most of what I was reading at the time. So here I am, decades later. I have a debt to Willard Price for that moment of clarity, and I’m paying it forward. This entry was posted in A Writing Life and tagged literature, memoir, review, science fiction, steampunk, writing on March 27, 2019 by sydlogsdon.